What to do about truck driver back pain . . . .
With taxi drivers and long distance truck drivers suffering low back pain at four times the national average, you fellas need some help. And if I can't provide hands-on, then a bit of solid information might make you able to help yourselves. Information is always half the cure. Sitting on the lower end of the spine all day isn't good for it. The spine is a tall, willowy column resembling a streamlined concertina. 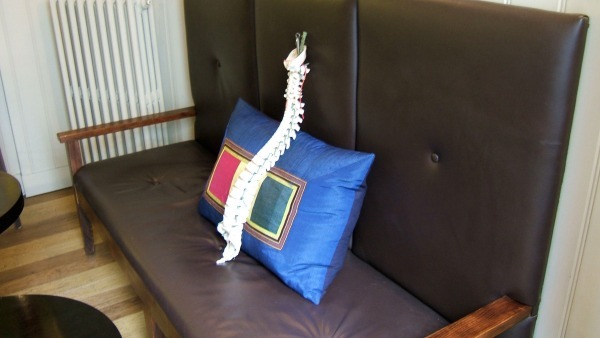 It has twenty-four vertebrae stacked on top of one another cushioned by pillows called intervertebral discs. The discs should be chokablock full of fluid. The discs are awe-inspiring structures. 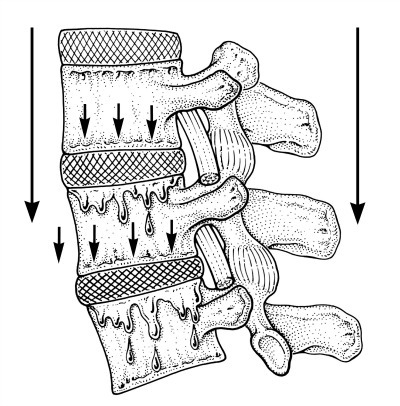 They not only act as springs, thrusting the vertebrae apart, they act as spinal connectors gluing them together. The more vigorously they spring their segments apart the more tautly they hold them secure, creating the whippy, tensile rod that can bend over double to pick up a sock and spring straight upright again. The more water a disc holds the healthier it will be and the better it performs. When a disc loses water it shrinks and becomes like a piece of compressed carpet - and this leads to other more complicated spinal problems. You can read in more detail here about the causes of back pain. In a nutshell, disc dehydration and thinning is how spinal problems get worse. The bad news is that sitting can speed everything up! Poor fellow doesn't know it yet, but he needs a BackBlock! Earlier civilisations didn't sit, or certainly not as much as we do today. Instead they squatted - to parlay with mates, prepare and eat food, go to the lavatory, deliver babies - and just about anything else you care to think of. So even though they might have run around all day with a spear - which dehydrated their lumbar discs - they would squat to rest. This had the beneficial effect of pulling the spinal segments apart and sucking in fluid to plump up the discs again. Squatting is Nature's spinal decompressor. Sitting is especially bad if you sit slumped. If your spine adopts a collapsed 'C' bend from top to bottom (similar posture though of different dynamics to squatting) your vertebrae compress together more at the front and your spine gets dry and brittle more quickly. 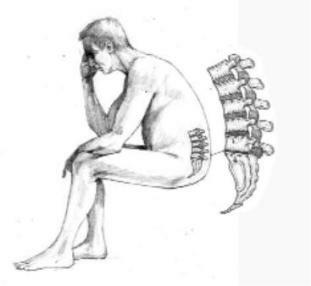 Ten percent of discal fluid is lost within the first two hours of sitting but the good news is that sitting with a better alignment, with the spine in an 'S' bend instead, retards the rate of spinal 'settling'. Something as simple as sitting with a relaxed lumbar hollow in your lower back, your shoulders aligned over your pelvis, can prevent the super-loading that dries the discs so quickly. 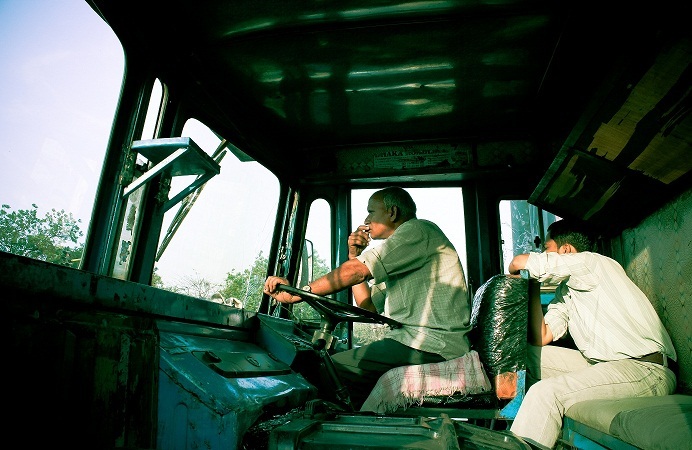 Truck seats have improved markedly over recent years, with well-sprung sit-up-and-beg modern ones with robust lumbar support far superior to the older ones more like a padded bench, where drivers had no help at all to sit up. Almost horizontal steering wheels also encouraged drivers to slump. The angle of the seat back makes a huge difference, with just a few degrees of backward angulation helping to un-load the discs and keep an 'S' bend, not a 'C' bend. Read more here about seat angles and the load-bearing effect in the spine as the same driving principles apply with truck and car. 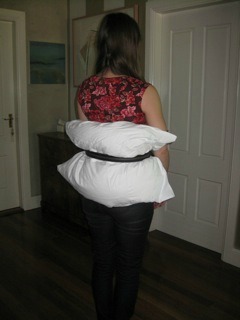 If you are a driver with a bad back, the best thing you can do is tie a bed pillow to the small of your back to keep going. This will make a huge difference. Being tied in place means it won't move around, either up or down, or go skew-whiff and slip sideways with the vibration and truck movement. The tie should be at the level of your forearm bent to a right-angle behind your back. Make sure the pillow is right in the small of your back (not up near your shoulder blades) and then lean back over it - and relax. In other words, let your belly hang out! This will switch your over-active back muscle off and make you better able to get through the shift. Vehicular vibration and rough roads increase the rate of fluid loss from the discs. No doubt, optimal tyre pressures help a lot here, but modern well-sprung seats also absorb vibration and retard steady impaction of the spine base. After many hours of driving it's important that drivers never jump down from the rig. The wider and capacious the exit route from the cab the better, since this eases movement into a spine that has become compressed and brittle - and easier to jar. Ideally, go straight into a squat when you get out (see below). Similar advice applies to driving (or being a passenger) in cars. See How To Sit In A Car. To decompress by squatting hold on to the front fender and with your feet together, heels flat, knees wide apart and lean back as try to get your bottom down closer to the ground. Try to remain down there for 20-30 seconds, or as long as it takes for the back to relax and the lumbar segments to start easing apart (this can be quite uncomfortable if you have been sitting there for hours). Although your knees will complain to start, within a week or two they will love it and in no time you will have better knees too. At the end of each day, as an antidote to all that sitting, ideally you need to have a session on a BackBlock before you turn in. You do the exercise by lying on your back on the floor with your knees bent. You then lift your bottom and slide the BackBlock under your sacrum (the hard, flat bone at the back of the pelvis) and then one at a time, straighten both legs out, letting them flop. It's as simple as that! You only remain there for one minute at a time (and it is quite normal to experience a very real discomfort in the base of your spine while there) but you can do several repetitions of one minute per session. After removing the BackBlock you must gently rock your knees to your chest until the discomfort in your low back has faded (approximately 30 seconds). Then you must do 15 curl ups where you stretch your arms forward and curl up, one cog at a time, bringing your head between your knees. If you fail to do the last two steps you will be sore after using the BackBlock. Watch out! Take care to place the BackBlock under your bottom - not the base of your spine. And if you have any reason to be concerned about your back you should consult your local doctor beforehand. Watch Sarah explaining all about the causes of back pain, how to get out of acute pain, spinal decompression and just about everything else you need to know in this amazingly comprehensive set of 14 videos. You can read more about what's in the package here.